The mid-thirties saw the introduction of improved record players. Although gramophones and Victrolas, which had been built to last, remained in use, new players were introduced that could play several discs sequentially, without user intervention. They were called "record changers" and suspended a stack of records—typically six or more—above the turntable on a tall spindle. When the user started playing a stack, the spindle would allow a single disk to drop to the turntable, where it would gently fall on a cushion of air created by the falling disk itself. A mechanism would then place the tone arm at the beginning of the record. When the record ended, the tone arm was guided by the record's groove into a center area that signaled the tone arm to rise and return itself to its resting place while the next disk dropped on its own cushion of air atop the disk below, and the process was repeated. The spindle was designed to sense when no records remained, at which point the record changer would turn itself off. And all of this was done mechanically, with no computer circuits around to help. Record changers were so popular that albums of records were designed to be played on them, with a properly arranged stack having sides 1, 2, and 3 on sequential records, which, when turned over, continued with sides 4, 5 and 6, in that order. The motor of a record changer was electric, not clockwork, as the old Victrolas had been. That was a necessity, as no clockwork spring could store enough energy to play an entire stack of records. And since electricity was therefore a requirement, there was also the opportunity to improve sound quality with another invention: The electronic amplifier. At issue was the fact devices that picked up sound and converted it to electricity, did so in minute amounts. On the other hand, magnet-based devices to play sounds back—loudspeakers—required huge amounts of current to do so. A device was needed that would amplify the electrical current, without otherwise altering the waveforms of the signal as it rapidly changed from positive to negative. Being a simpler time with fewer distractions, any number of hobbyists played with the concept of the vacuum tube. 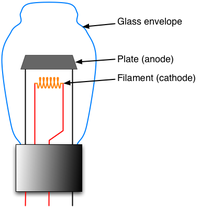 The next basic advance was called the triode, though it didn't make use of a true vacuum. Later versions did. 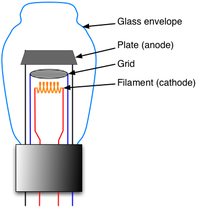 Essentially, a triode uses three connections to work its magic. In between the filament and the plate, a component called the grid is inserted. The grid can be made either negative or positive; as the polarity changes, so does the amount of electrons that can reach the plate. The best part is, the grid voltage/current can be very small, yet have a giant impact on the amount of current flowing through the tube. Voila! A triode is an amplifier. The vibrating needle or stylus in the record groove, sets up a small, varying electric voltage by vibrating a magnet within a coil of wires. That voltage, passed through a triode, controls a large current, powerful enough to work an electromagnet, making it vibrate in sympathy with the stylus. That electromagnet, in turn, alternately—and thousands of times a second—attracts and repels a cone of cardboard in which an iron wire has been embedded. That cone, pushing against the air in the room, reproduces the original sound. In 1948, Columbia Records introduced a significant modification to the phonograph record. The idea was to cram a whole album of records onto a single, two-sided disk. To accomplish this, they slowed the speed from 78 revolutions per minute to 33 1/3, narrowed the size of the groove which allowed the grooves to be placed closer together, and used the largest practical size, 12 inches, for a record (most 78s had a diameter of 10 inches). And they switched from shellac to vinyl, which provided a surface so quiet that the increased noise inherent in narrow grooves and slow surface speed was not apparent. The end result: It was now possible to store an entire collection of songs, such as had been released as an album of records, on a single-disk "record album." The next year, however, RCA introduced a competing format. Also making use of a slower speed (45 RPMs) and vinyl for improved noise levels, these were the minimum record size for 78s (7 inches) and also had a much larger spindle hole to better accommodate the mechanisms of juke boxes. In terms of play length, 45s were equivalent to 78s. Columbia had built players for their 33s, as they came to be called, that of course could not accommodate 45s, though they were able to play the home user's backlog of 78s. RCA designed players for their 45s that could play nothing else. And so the game of Competing Formats was on. Until 1950, consumers held their breaths and eagerly read each issue of Popular Mechanics for predictions of which format would succeed. Remember, consumers who guessed wrong would find themselves the owners of unplayable records and useless players. 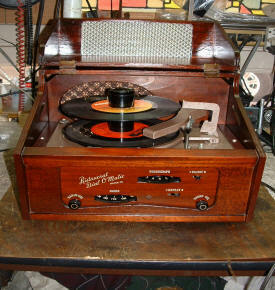 However, since the difference in formats was not patentable, third-party phonograph manufacturers were happy to produce players that could adapt to any of the existing formats. The spindle size was the same for 78s and 33s, and a large adapter could easily allow a standard player to accommodate 45s. The change in speed was managed by a speed control that simply changed gears on the turntable. 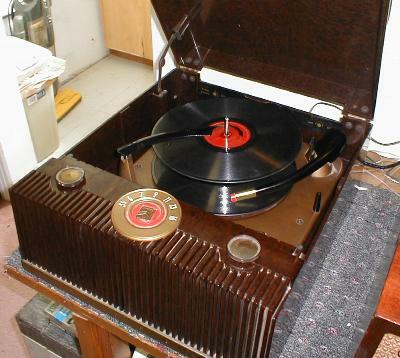 And a flipable needle supported the playing of the wide-grooved 78s or the narrow-grooved 45s and 33s. And it turned out there was a place for both formats. 45s, holding just two songs apiece—typically an "A" side and a less-popular "B" side—were inexpensive, marketed to teenagers, and were thought of as "singles." They were very popular at parties and radio stations. 33s, on the other hand, were marketed to adults, especially fans of classical music pieces which, because they had been written before the invention of the phonograph, tended to run far longer than the 3 1/2 minute length of a 45 (or 78). Rarely used variations occasionally appeared. For example, 7" 45 RPM "EPs" (extended play) records could hold two songs per side by lowering the volume and therefore the groove width. (Louder noises create wider grooves.) Conversely, 12" 45 RPM disco releases (with or without the wide center hole) allowed a wider groove to accommodate loud, repetitive bass lines. And 7" 33 1/3 RPM "mini-albums" had room for three or four songs per side. Mostly, however, these size variants were used to attract consumer attention and succeeded simply because they were so rare. It was also possible to embed a picture in a record, by covering it with clear vinyl instead of the blackened kind. The sound quality was slightly lessened (clear vinyl isn't as quiet) but "picture albums" were, and are, collector's items sometimes fetching thousands of times the record's original list price. The low-tech requirements of the phonograph record enabled many curious variants. For example, Red Raven Records included a whole circle of small, embedded drawings. When the "Magic Mirror" device was placed on the record as it played, the angled mirrors turned the drawings into a simple animation. 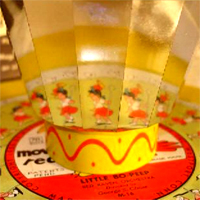 The device was derived from the popular 19th century Zoetrope animation wheel. Although it couldn't be used on a record changer, children's record players only played one disk at a time anyway; so that wasn't a problem. Last April, a collection of 20 Red Raven records with an original Magic Mirror sold on eBay for $515. But the most successful variation was introduced in 1958 (though patented in 1931): Stereophonic sound, soon shortened to "stereo". For at least two decades, this innovation was found only on 33 1/3 RPM records, though there was no real reason for the limitation. To create a stereo recording, the original performance had to be recorded using at least two microphones (simulating a listener's two ears), and the signal from each microphone had to be kept distinct from the other. This was normally done by recording onto recording tape with two tracks, where all the circuitry was duplicated: Two amplifiers, two recording heads, and so on. 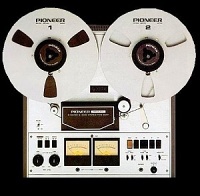 The two channels of sound were then physically associated by the tape so they couldn't get out of sync. In a stereo record groove, the groove is V-shaped, and each arm of the V carries the information for one channel of the program. When played by an older, monaural (single-channel) player, the needle would average out the information, combining it so the listener could hear both channels from one speaker. When played on a stereo player, the needle would vibrate in two planes, each 45 degrees from the other. This complex movement allowed the two channels to remain distinct, to be sent to two amplifiers which drove two loudspeakers. The very cool side effect of this was that it was a backward-compatible system. When a mono record was played on a stereo player, the needle's movement was identical for both left and right channels. There was therefore no true stereo signal; yet the sound still sounded better coming through two speakers than one. Anyone will agree that the experience of listening to stereophonic sound is much more satisfying than listening to mono. Yet there's no denying that the forward and backward compatibility of stereo records with mono players, and mono records with stereo players, was the primary factor in the new technology's quick and easy acceptance. Contrast that to the next enhancement, introduced in 1971: Quadraphonic sound. If two speakers made music sound better than one, wouldn't four speakers make it sound even better? However, there were three competing formats and, while two were compatible with stereo players, they were not really compatible with each other. To produce a quadraphonic record, at least four microphones were required and the performance had to be recorded onto at least four channels on tape. At that point, each of the competing systems diverged. Two of the systems allowed a mathematical combination of the four channels to be stored as just two. One of the extra channels was "subtracted" from another, while the other was "added." Circuitry in the player recreated the original four signals, more or less; they were then amplified separately (by four amplifiers) and each sent to one of four loudspeakers. These two systems differed only in their mathematics and could be successfully played on stereo players without losing any of the sound. The third system came from RCA, the company with a spectacular parade of failures in the Competing Formats wars. Not only did their CD-4 quadraphonic system tank, so did their Video Discs and, for that matter, their 45 RPM EPs. Their problem seems to have been over-engineering. In CD-4 (which has no relationship to today's compact discs), the two rear channels were encoded at an ultrasonic frequency and combined with the front channels. 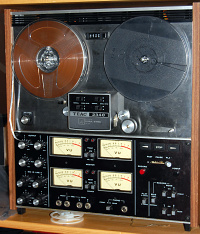 The result was a stereo record with two "carrier" channels. If played on a regular stereo, the rear channels simply weren't reproduced. In fact, they were generally erased from the disk by the relatively-clunky stereo needle. They had to be played on a player with a special—and expensive—CD-4 needle and cartridge. The cartridge itself decoded the extra signals, sending four channels of sound to the four-channel amplifier. And even then, the ultrasonic channels generally wore out after a few plays. And so, quadraphonic sound failed, only to reappear a quarter of a century later as Surround Sound. Quadraphonic failed, I maintain, because of the competing systems—something that wouldn't have happened if the companies involved were more concerned with improving the lives of people everywhere, than in improving their own company's profits. Dolby Surround Sound succeeded, on the other hand, because there was no other format competing for the public's attention (the various formats are all compatible), and also because the system is thoroughly forward-and-backward compatible with non-Surround Sound disks. Probably the most famous record ever was made in 1977, with two copies pressed on gold disks. 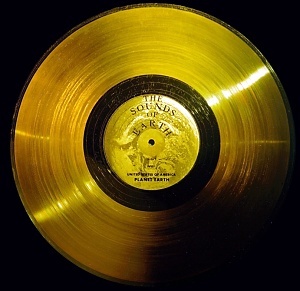 This was the Voyager record, and each of the gold disks was attached to one of the Voyager spacecraft launched that year and sent into deep space. The recording includes greetings in 55 languages, including Akkadian (a language spoken in Sumer 6000 years ago!) and music ranging from the second movement of Bach's 2nd Brandenburg Concerto, to Chuck Berry's "Johnny B. Goode." At the speed at which the probes are traveling, it will take them about 40,000 years before they reach the nearest star. It's interesting to ponder the fact that if one of the probes should return to Earth now, a mere thirty years after their departure…we'd be hard put to find a phonograph to play the record on.